An intimate moment shared between newlyweds shortly after their ceremony, this image feels like a private peek into their world. The groom's attention is fixated on his bride, while she optimistically looks away, almost too excited to hold still. (No one would have been surprised if she’d sprouted wings and soared into the sky with elation.) Her blush raw silk wedding gown, his cobalt blue three piece suit, and the lush green jungle background contrast perfectly, drawing attention to the beautiful light on her face and her elegant upswept hair with her delicate veil gracing her shoulders before floating to the ground. The choice of a longer portrait lens for this image creates a pleasing softness to the wall of jungle greenery behind the groom, blurring the shades of dark and light green with smooth bokeh, but keeping the upper and lower spiky palms on the same plane of focus. The lower palms fan outward in a hopeful, uprising visual, while the overhead spikiness is reminiscent of a bursting firework, almost as if nature itself was celebrating. 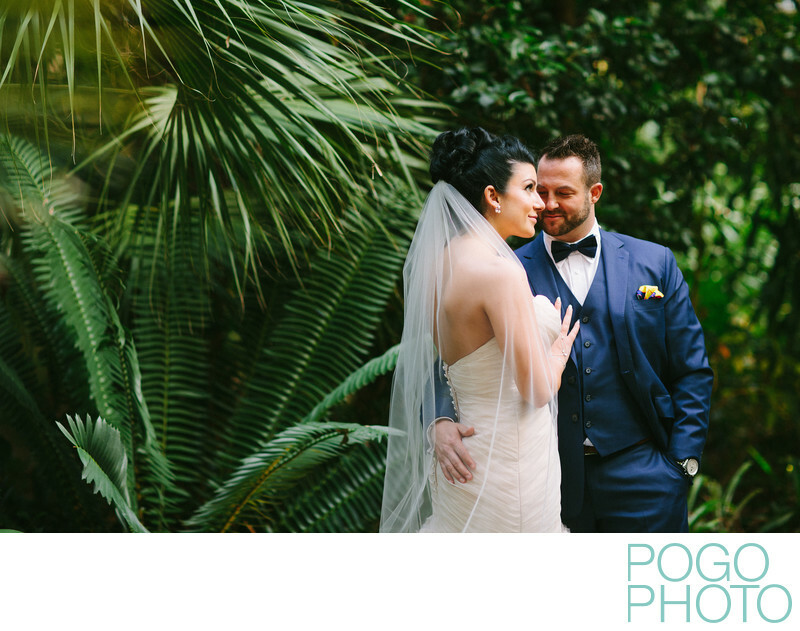 This image is from a destination wedding client hosting their wedding at the Ann Norton Sculpture Gardens in West Palm Beach, Florida; the lush warmth of January in South Florida must have been a welcome respite from the blowing ice and wind in their home city of Boston, Massachusetts. Choosing South Florida as a destination for a winter wedding is an excellent alternative to island weddings in the Bahamas or Caribbean; not only is the area more accessible by ground and air transportation, the amenities that guests expect are in ample supply, with every national chain within easy reach from the West Palm Beach area. 1/250; f/2.0; ISO 800; 85.0 mm.